I first became aware of Jeanette Winterson from an interview she did with Bill Moyers when her take on the Atlas myth, Weight: The Myth of Atlas and Heracles, came out. She and the book sounded intriguing, and I wasn't disappointed in either. I haven't read a lot of her adult fiction subsequently (Oranges are Not the Only Fruit and her SF outing, The Stone Gods) but I've been impressed by the ideas she wrestles with and by her writing abilities so I was a bit disappointed in Tanglewreck, her initial foray into the young-adult market. The story is decent enough: Our eleven-year-old heroine, Silver River, has lost her parents and older sister, and now lives alone in the family home of Tanglewreck with an aunt (who turns out to be a con-artist hoping to steal Silver's estate) and her mean-spirited rabbit Bigamist. In the world at large, Time appears to be falling apart - Time Tornadoes are ripping apart the fabric of Time and causing fear and panic. 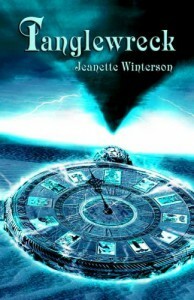 None of this impacts directly on Silver until a mysterious stranger, Abel Darkwater, comes by looking for the Timekeeper, and Silver finds herself looking for this missing artifact in a race against Darkwater and a second villain - Regalia Mason, whose company, Quanta, promises to end the temporal disruptions but at a frightening cost. The story is reasonably inventive and enjoyable, and Winterson manages to weave in a number of points about quantum mechanics, time and space without making things tedious similar to how Norton Juster injects math and linguistics into The Phantom Tollbooth. But here's my primary "problem" with Tanglewreck: It's not as much fun to read as The Phantom Tollbooth or China Mieville's Un Lun Dun, another book I kept thinking about as I read this one. My sense when reading was that Winterson was forcing the "young-adult ambiance"; the prose didn't sound as natural as it does (to me) in her adult fiction. That said, I still enjoyed Tanglewreck even though it doesn't play to Winterson's strengths, and I'm still looking forward to eventually reading her second YA venture - The Battle of the Sun. And I will be regifting this to my nieces come the Xmas season.